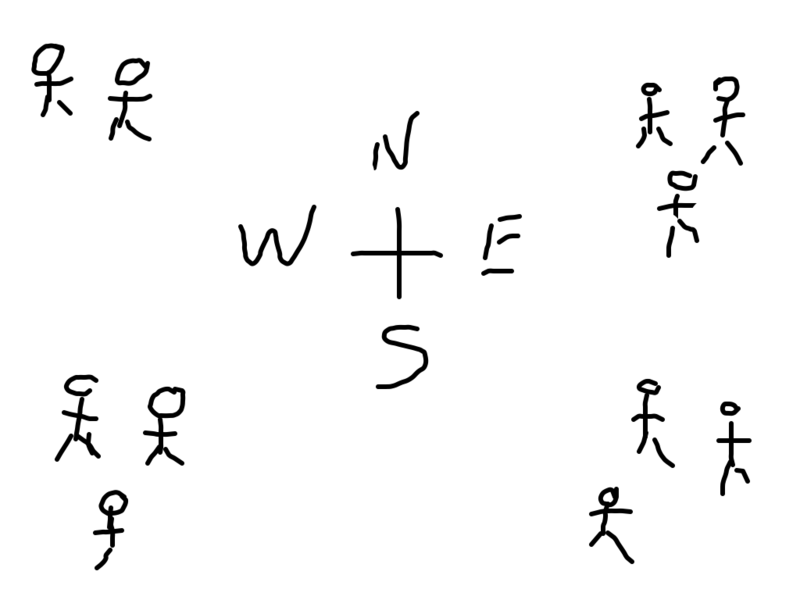 The Cardinal Directions activity is great for getting people moving, sharing things about each individual, while, at the same time, helping everyone understand the differences and similarities on a large group of people. Set up a large room with space for everyone to move around. 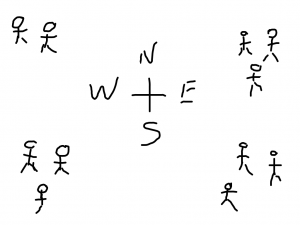 Draw a simple compass in the middle of the room (with tape and post it), marking the North, South, East and West directions. Identify the primary cardinals in the room walls. For example: North – the window side, South – the door side, East – the projector side and West – the nice painting side. It is more important to match a cardinal direction to a room wall than to be precise about the cardinal direction. Prepare a print-out page with interesting questions (yes/no style). There are some sample questions below. 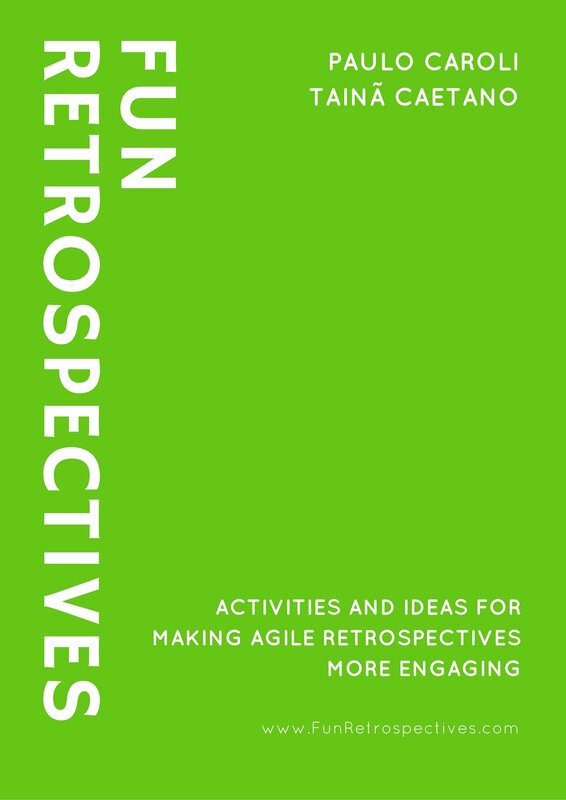 Feel free to create your own, or ask people to create their questions during the activity. Read one question, point to the North and tell it represents the yes answer. Then ask the participants to move accordingly. As the questions are a yes or no option, each person must select a side of the room, either yes or no, representing North or South. Read another question, point to the East and tell it represents the yes answer. Then ask the participants to move accordingly. Please note that the participants will now stand in one of the following four cardinals: NE, NW, SE, or SW.
Repeat as long as you wish. Keep reading questions and asking people to move accordingly. Make sure to alternate between N-S and E-W movements. Please nto that in any moment in time people will be standing in one of the four room corners, or cardinals: NE, NW, SE, or SW. I find this activity very energizing and visual. It keeps everyone moving while being visual about the number of people representing each yes and no. At times, I rather pass the print out of questions around, asking people to either read one question or make a yes/no question. This gives everyone the opportunity to be creative with questions, and perhaps find out specific information they are interested at. On a Friday night, do prefer staying at home rather than going out with friends? When keeping an appointment would you generally arrive at the last moment? In general, do you usually think carefully before speaking? At home, do you become irritated easily when things are not in their proper place? Do you often use your hands when talking? Do you find it easy to keep your emotions under control? Do you find it difficult to go up to strangers at a social gathering and introduce yourself? Do other people normally know what you are doing or feeling without you telling them? Do you plan your activities well ahead of time? Do you usually complain when someone keeps you waiting? When you feel down hearted, do you normally find someone to cheer you up? Would you generally rather see a documentary than a comedy on TV? When you have made a big mistake at work can you normally forget about it easily? When you see a picture hanging crooked on the wall, would you like to straighten it? Do you usually have specific goals and a definite sense of direction in your life? If someone in a social group expresses a point that view that differs from yours, would you normally keep quiet? Are you usually talkative when you are with people that you know? When you are renting a place, would you insist on a written agreement before paying your money? Do you often say or do things without thinking? When you have done something wrong can you normally forget about it quickly and focus on the future? Do you often tell jokes and funny stories to your friends? Does your future on the whole seem promising and right to you? Do you frequently think about your future and the course that your life is taking right now? After completing an important task do you often feel like you should have done it better? Many of these questions are from the JSK Personality personality test. When closing the activity, you could say a message to raise the team building moment. Sometimes we are close to some one person, other times we are c lose to someone else. It varies at times, but it is essential to remember, we are all one team!